A public relations major who played on Northwestern’s soccer team while working on the student newspaper and serving as a writing tutor, Graham got the internship of his dreams as a senior. He was placed with a sports PR firm in Chicago. 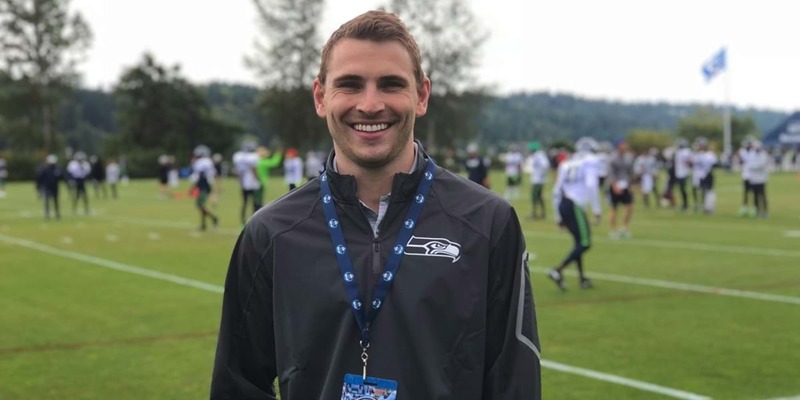 That experience led directly to his first job with a professional tennis tournament, which in turn led to his job with the Seattle Seahawks. My job is primarily focused on digital communications for both the Seattle Seahawks and CenturyLink Field. This includes providing information for season ticket holders and event attendees, as well as promoting merchandise and upcoming initiatives. I work with email communication execution and marketing campaign strategy, and because my experience is so broad and our full-time marketing team is six people, I'm able to pitch in on a wide range of projects. What do you do on game day? I’m involved with our game-day entertainment team. I help oversee pregame entertainment; there are four bands and DJs in different locations around the stadium that perform for a couple hours before kickoff. Additionally, I've been helping with some of our pre-tape and live video hits, timeout activations and halftime show. As a communications major, I was fortunate to have several opportunities to put my classroom knowledge to use both for local businesses and during my internship. Those experiences helped me to think holistically about projects or campaigns, and that’s a valuable skill I still use daily. What do you feel you gained the most from your NWC experience? In one word, I’d say confidence. It will always be difficult to enter an unfamiliar setting or a new stage of life, but through my experiences academically, socially, spiritually and even athletically, I gained confidence that I now have a skill set and outlook to thrive no matter where life takes me. What are Northwestern’s professors like? The beautiful thing about Northwestern’s professors is they focus on more than just teaching a subject; they’re also interested in students as people. Professors are as excited about students’ faith development, maturation and expansion of worldview as they are about their field of expertise. That’s an amazing environment to spend emerging adulthood in. What are some of your favorite memories from NWC? Three highlights: friends, soccer and internship. I made many of my closest friends on the soccer team as well as in the communications program. In soccer, the simplest explanation is I was able to work really hard and celebrate successes with an absolutely quality crew. Lastly, the internship was really an amalgamation of all I had done in college and was an ideal capstone for my academic career. I was interested in a small college where I could further my faith, play soccer and participate in service projects. Northwestern provided all of that and—while I didn’t know what I wanted to major in initially—proved to be a fantastic place to pursue public relations. Why did you decide to major in public relations? I really enjoyed writing in high school, and that led me to enroll in a Media Writing class with Professor Ann Minnick. There was something exhilarating about working in or with media that made the course compelling. After the first week in Media Writing, I was hooked and knew public relations was the right fit for my skills and interests. How has studying at a liberal arts college benefited you in your career? With a liberal arts education, I wasn’t trained just to do a job; I was equipped with skills to help me in all situations. Given that kind of preparation, I have confidence in myself and my abilities even when I’m asked to do something new.